UP Voter ID List 2019 Online and Download PDF of Uttar Pradesh Matdata Suchi 2019: Lok Sabha elections are on its way, everybody excited and looking forward to this one of the biggest events in India. If you have applied for new voter ID in Uttar Pradesh, you can check UP voter ID list 2019. Also you can use this article to check your name in UP voter ID list 2019. Direct link is provided below. This year, there are around 15 million first time electorates and these voters will be using their voting power first time. Parliamentary elections are conducted every five and it one of the biggest event through which a government is selected. This is the reason each and every vote is important. Latest: Check you name in NVSP voter ID list 2019. Click on blue link to visit the page to know more about it. Being one of the biggest states in India (either from the point of population or from the number of assembly constituencies), it has been always a point of attraction at the time of General election. Uttar Pradesh will be having a huge number of voters (including both existing and new) this year. Only those people will be able to vote whose names will be there in the UP voter list 2019. For this, they need to check their names in the UP electoral roll of the Election Commission. Every state has their own election department that caters to all the matters related to elections. Electoral Roll PDF includes the list of all the voters who have a UP voter ID card and have their names listed in Election Commission of India. If you are for UP then you must have your names in the electoral roll list of COE, UP. In this article, we have shared all the necessary information regarding Lok Sabha elections with respect to UP and about the electoral roll PDF. Scroll down and how can you download UP voter ID list PDF online. Election Commission of India (ECI) nominates a Chief Electoral Officer (CEO) for every state who supervise the parliamentary and Assembly elections in that particular state/Union Territory. CEO is basically the government officers of the state/UTs itself who is appointed to manage all the tasks related to Assembly and Parliament elections in state under the supervision of ECI. CEO, Uttar Pradesh does the same task for the state. If you want to download the voter list PDF, then you just have to visit the official website CEO and get you voter list downloaded. 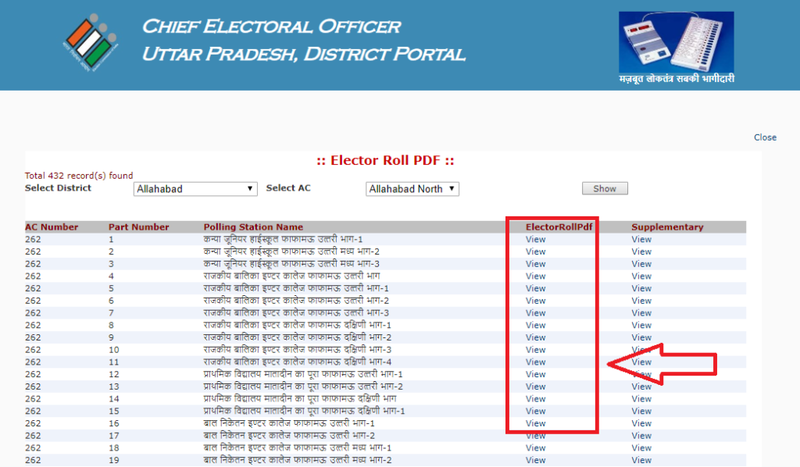 Click on the “Electoral Roll PDF” link given on the homepage of the portal. Select district and AC (Assembly Constituency). Click on “show” button. A list of all the Polling stations in selected district and AC will appear. You have to search you polling station and have to click on “View” option given under the Electoral Roll PDF option. Enter the captcha code and click “View/Download” Option. Now you can see voter list PDF on your screen. Voter list will carry the names and other details of all the registered voters of that particular polling station you have selected. Lastly, you can click on download or print option to keep it safe with you. If you have any problem in finding you name in UP voter ID list 2019, you can comment below your details our team will help in finding and solving your query. VOTER LIST FOR BAREILLY (U.P.) IS IN URDU LANGUAGE WHICH IS NOT KNOWN TO A LARGE NUMBER OF POPULATION. THEN HOW TO CHECK VOTERS NAME IN IT. My Voter Photo Identity Card No. is TXQ5688585 Voterand my wife Prabha Singh’s Voter Photo Identity Card No, is TXQ5688692. What is our polling booth and what is our serial no. in Voter list? Please help. Sir my name voter list available or not?? voter id no. kyaa hai ? Bharatiya Janata party koi problem hai Kya results aacha aayega mai Rambabu Vishwakarama Bharatiya Janata party see hnu mujhe garb hai ki Bharatiya Janata party ki jeet ho eske details mere email par dijiye OK………… Bharatiya Janata party ki aor se jai hind.rambabuvishawakarama..
Voter ID No.UP/20/102/546055&UP/20/102/546056 in the name of Moid Alam s/o Mahmood Alam&ATIYA BANO w/o Moid Alam not found in the voter list 2019 belonging to UP Lucknow.Assembly constituency is Lucknow North . Please help us to poll the vote for coming Lok Sabha . Thanking you in anticipation.